From Trish of New Braunfels, Texas on 12/8/2018 . These are another of our family favorites. Been eating them since we lived in Indiana several decades ago. Yummy on burgers or other sandwiches. 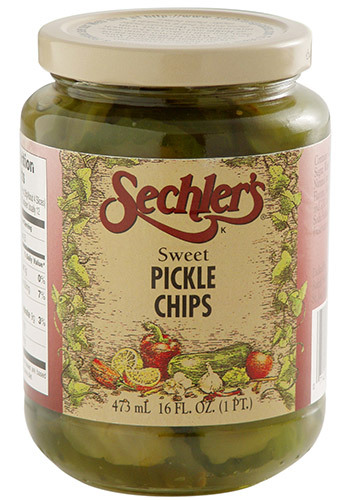 Always keep some on hand & reorder when we open the last jar. Wish they had a wider market so we could buy them here in Texas but worth the cost of online shopping to keep them around. From goaway of Chicago, Illinois on 11/30/2018 . Good pickles. Not quite the standard sweet pickle chips that used to be on every supermarket shelf, which is what I'm after, believe it or not. But close. However, be warned, Sechlers sends emails soliciting reviews, AND give you no Unsubscribe option. Not having Unsubscribe is a big marketing no no. From Bess Schatz of Chicago, Illinois on 11/9/2018 . this product. Thank you for making it so easy to acquire!!! From Dawn Harris of Royal Oak, Michigan on 11/29/2017 .